Watch Dr. Corey Olsen adventure as Gryfflet, the thieving hobbit! Every Friday, Dr. Corey Olsen explores the virtual realms of LOTRO’s Middle-earth with Gryfflet, the mischievous and thievious hobbit. As part of the Fall campaign, Dr. Olsen will take Gryfflet through the Moria epic quest in a special “Dimrill Dale or Bust” episode of his ongoing adventure. 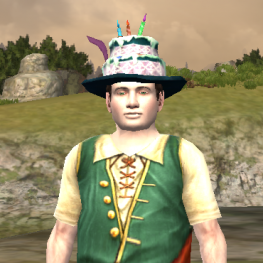 LOTRO has plenty of side quests through which you can take your character to gain experience, get gear, complete deeds, and earn special titles. For our Fall Campaign, Signum also has a side quest to raise $5,000 during this event. If we are successful, Dr. Olsen will conduct a second LOTRO marathon with his guardian Wigend. Support the Wigend Marathon Here!